The perfect integration of design, technology and process. Face-to-passport verification checks the passengers face against the digital image pulled from their passport. A biometric algorithm measures the distance between certain points on the face and matches those measurements to the passport photo. All ABD units are Disability Discrimination Act (DDA) and Passenger with Reduced Mobility (PRM) compliant. Options are available for passengers to pay excess baggage fees on the spot. Status indicators signal the need for passenger assistance or if a unit requires servicing. During processing, a Dynamic Virtual Box surrounds the bag, adjusting to its specific size and shape. 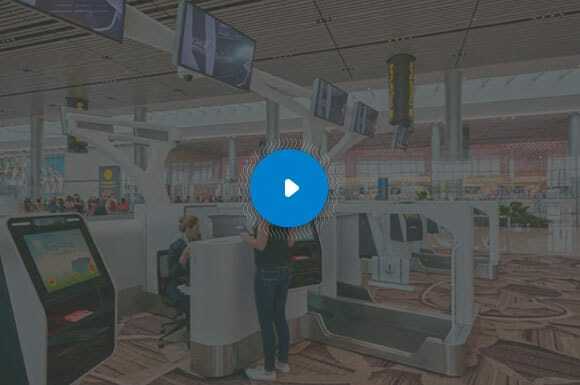 Any foreign object that enters the virtual box will interrupt the process immediately, stopping moving conveyors ensuring passengers are safe from moving parts. The low profile and use of safety glass increases visibility and allows one agent to easily monitor multiple units. With a transverse loading system, passengers load their bag from the side, facilitating a more ergonomic process that reduces body strain. As the belt is flat the luggage cannot roll off. Series 7 Hybrid ABD units are fitted with either a Rotating Desk or a Fixed Desk, so that they can be used in agent mode as well as self-service mode. They can be switched from self-service to agent mode in a matter of seconds. Responsive and generously sized for ease of use. Baggage profiling and conveyability analysis (upright bags, multiple bags, non-conveyable bags, tubs etc). Detects intrusion onto the conveyors whilst the bag is being processed. This increases passenger safety, security and baggage weighing integrity. Bag tag readers eliminate the need for hand-held scanning by passengers. Additional features such as biometric verification, passport validation, payment terminals, CCTV and RFID may be retrofitted on. Baggage receipt printing per transaction (multiple bags on the same receipt). Facilitates excess baggage revenue collection by printing excess payment advice. Up to 3 printers may be installed accommodating a 1 or 2-step process. PAX operated for boarding pass and IATA bag tag scanning using a tethered, robust hand-held scanner. Biometric capabilities for single token end-to-end processing, including passenger live feedback camera. Responsive, generously sized for ease of use, with Anti-Glare filter. Touch points and user heights are compliant with Australia’s Disability Discrimination Act (DDA) and People with Reduced Mobility (PRM). Optional Disability Nav-pad available for compliance with American Disabilities Act (ADA). Allows passengers of airlines configured for the kiosk to pay for additional bags, flights, upgrades, meals or other ancillary services. Full page passport reader via MRZ (Machine-Readable Zone) or RFID data from ePassports. Barcodes can be inserted face up or face down. Up to 3 printers (Receipt/ Bag Tag/ Heavy Tag) may be installed accommodating a 1 or 2-step process. High quality printing (200 DPI) with cut and hold. Liner-less bag tags supported. Lighting on console to alert passengers. Responsive, generously sized for ease of use, with Anti Glare filter. Touch points and user heights are compliant with Australia’s Disability Discrimination Act (DDA) and People with Reduced Mobility (PRM). High quality printing (200 DPI) with cut and hold. Optional second boarding pass printer for maximum capacity. High quality printing (200 DPI) with cut and hold. Optional second bag tag printer for maximum capacity. Liner-less bag tags supported. Glowing Frame Edge Light indicators signal the need for passenger assistance or if a unit requires servicing. For a more comprehensive understanding about ICM’s full product and service offering, take a look through our most up-to-date brochures, videos and photo gallery.